Epus. Asaphen. Ds. Hardwicke, Cancellarius. The Lord Onslow reported from the Lords Committees to whom the Bill, intituled, "An Act to enable the present and future Proprietors and Inhabitants of the Houses in Red Lyon Square, in the County of Middlesex, to make a Rate on themselves, for raising Money sufficient to enclose, pave, watch, clean, and adorn, the said Square," was committed: "That they had considered the said Bill, and examined the Allegations thereof, which they found to be true; and that the Committee had gone through the Bill, and directed him to report the same to the House, without any Amendment." Perrier & al. to be added to Nat. Bill. Upon reading the Petition of Francis Perier and James Solier; praying, "That their Names may be inserted in the Bill for naturalizing Bartholomew Baratty:"
It is Ordered, That the said Petition do lie on the Table till the Bill be read a Second Time. The House (according to Order) was adjourned during Pleasure, and put into a Committee, to consider in what Place the Lord Justice Clerk, and the other Judges of the Court of Justiciary in Scotland, who are ordered to attend, shall be heard. "That it is the Opinion of the Committee, that such of the Lords of the Justiciary in Scotland, as were summoned to attend this House by Order of the 21st of March last, should be heard at the Bar." Then it being proposed "To agree with the Committee in the said Resolution:"
Ordered, That Chairs be set at the Bar, for the said Lords of Justiciary. Proposed, "To agree to proper Questions to be put to them, when they come to the Bar." Questions to be put to them. "1. Whether, by the Interlocutor of Relevancy, in the Case of Captain Porteous, the Pannel was restrained from proving any Orders given to him, by the Magistrates, to fire, in case of Resistance, at the Execution of Andrew Wilson; and, if he was restrained from proving such Orders, for what Reason he was so restrained?" "2. Whether, according to the Law of Scotland, and the Forms of Proceedings in Criminal Cases there, when an Interlocutor of Relevancy is pronounced by the Court, such Interlocutor is not the Rule and Diréction to the Criminal, with respect to the Evidence he is to offer to the Court?" "3. Whether such Interlocutor of Relevancy is not to be the Rule to the Jury, to guide them as to the Facts they are to determine by their Verdict?" "4. Whether, by the Law of Scotland, where the Matter urged by the Pannel in his Defence is admitted on the Part of the Crown, if the Jury shall find the Facts alleged against the Pannel specially, the Court is obliged to pronounce Sentence upon the Facts so found by the Jury; or may take Time to consider whether the Defence so admitted ought not to mitigate such Sentence; and whether, by the Laws of Scotland, a Motion by the Pannel's Counsel may be made in Arrest or Stay of Judgement?" Then the Lords of Justiciary were called in. The Lord Dun, the Junior Judge, was asked the First Question. And he acquainted the House, by Way of Apology, how sorry they were for the great Trouble this Matter had given their Lordships; and said, "That the said Interlocutor was according to the Law of Scotland, and unanimous; and that the Pannel was under no Restraint that was hurtful or prejudicial to him in making his Defence." The Lord Royston declared himself of the same Opipinion. And the Lord Justice Clerk acquainted the House, That, in the Trial, the Judges were unanimous as to the Relevancy and Verdict; and though he himself had no Vote, yet he concurred with the other Judges in Opinion, that it was agreeable to the Law of Scotland, and so signed it; which he must have done had he not approved of it: And that Care was taken no Defences were repelled, but every Thing left open." The next Question put to the Junior Judge; to which they were all heard seriatim, and gave an Account of the Method in which the Court proceeded; and acquainted the House, "That, by the Law of Scotland, where the Defence is sustained, the Pannel is at Liberty; but where repelled, he is not at Liberty." The Third Question asked in like Manner. Whereupon they acquainted the House, "That no Interlocutory Sentence by the Judges can hinder but that the Jury may bring in a Verdict, Guilty, or Not Guilty." And the Lord Justice Clerk mentioned, "That by an Act of Parliament, the Jury had a great Latitude." The Fourth and last Question put in the same Manner. To which they answered, "That, after the Proof was concluded, and the Jury sent out, they bring the Verdict the next Day into Court, sealed up; where it is openly read, in Presence of the Prisoner; and the Judges are obliged to give Sentence, whether the Verdict was right or wrong." Then, the Lords of Justiciary having declared they had nothing further to offer, they were directed to withdraw. Dominus Cancellarius declaravit præsens Parliamentum continuandum esse usque ad et in diem Martis, tertium diem instantis Maii, hora undecima Auroræ, Dominis sic decernentibus. Commons give Leave for their Members to attend. 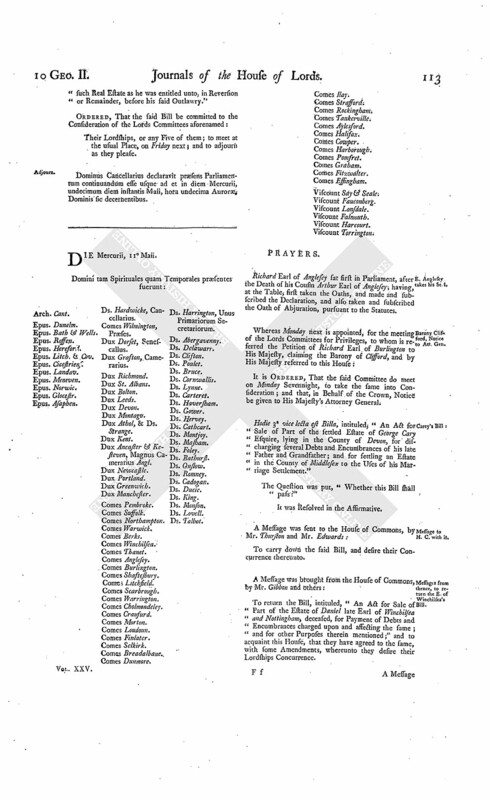 The Messengers ordered to be sent to the House of Commons on Friday last, "To desire, that they will give Leave that Duncan Forbes Esquire, His Majesty's Advocate for Scotland, Charles Areskine Esquire, Solicitor General for Scotland, and Patrick Lindsey Esquire, may attend this House, to be examined, as Witnesses, upon the Bill relating to the Provost and City of Edinburgh," acquainted the House, "That they had delivered their Lordships Message; and that the Commons would return an Answer by Messengers of their own." To acquaint this House, "That they have given Leave to the Gentlemen abovementioned to come to this House, as is desired by the said Message, if they think sit." St Olaves Church rebuilding, Bill. With a Bill, intituled, "An Act for re-building the Church of the Parish of St. Olave, in the City of London, and in the Borough of Southwark, in the County of Surrey;" to which they desire the Concurrence of this House. Messages to H. C. for other Members to attend. Ordered, That a Message be sent to the House of Commons, "To desire, that they will give Leave, that Lieutenant General Wade, James Erskine Esquire, Sir James Campbell, Alexander Hamilton Esquire, and Patrick Heron Esquire, Members of their House, may attend this House, in order to be examined, as Witnesses, upon the Second Reading of the Bill relating to the Provost and City of Edinburgh." And a Message was sent, by Mr. Allen and Mr. Edwards, for that Purpose. Friendly Insurance Edinburgh, Petition against the Bill for disabling the Provost, &c.
Upon reading the Petition of Thomas Elliot Gentleman, Agent for the Edinburgh Friendly Insurance against Losses by Fire, for and on Behalf of the said Society, and the Members thereof; praying, "That they may have Liberty to be heard, by their Counsel, against such Part of the Bill relating to the Provost and City of Edinburgh as is for abolishing the Guard kept up in the said City, called The Town Guard; and for taking away the Gates of The Nether-Bow-Port, and for keeping open the same:"
Questions put to the English and Scotch Judges, with respect to the Military Power. "If an Execution should be performed in Stocks Market, where a Guard of the regular Troops should be drawn up, by lawful Command, to prevent a Rescue of the Criminal; and should several Stones thrown from among the Crowd light among them, by some of which several Soldiers should be bruised and wounded; would such Guard be guilty of a Crime, if, by firing among the Crowd, they should kill several Persons; and if guilty of a Crime, what Crime it would be?" "Upon Occasion of a Riot in or near a Town where a Regiment is quartered; should the Sheriff of the County order the Commanding Officer to assemble the Regiment, and march to his Assistance against the Rioters; is such Officer obliged to obey? or may he obey? and what Penalty there is, if the Officer should refuse?" "If a Detachment of the Army is ordered to prevent a Number of People from pulling down of Houses, or committing any other illegal Action, and that the Commanding Officer of such Detachment has Orders to repel Force by Force; can such Detachment lawfully make Use of Force by firing, unless they are attacked by the Rioters?" "In case Rioters should be pulling down Houses, or doing other Mischief, in one Part of the Town, and a Detachment of the Army should be ordered, in Aid of the Civil Magistrate, to march thither to disperse them, and a Number of People should assemble, and stop up some of the Passages through which such Detachment must necessarily pass; whether such Detachment may use Force, to disperse the People so assembled, in order to pass that Way, without being first attacked by them?" Ordered, That the several Judges of the Court of Justiciary in Scotland do lay before this House, in Writing, their Opinions as to the Law of Scotland, upon the same Questions, except varying the Words in the First Question from ["Stocks Market"] to ["The Grass Market at Edinburgh"]; and do sign their said Opinions. Commons give Leave for Members to attend. The Messengers sent to the House of Commons, To desire they will give Leave, that Lieutenant General Wade, James Erskine Esquire, Sir James Campbell, Alexander Hamilton Esquire, and Patrick Heron Esquire, Members of their House, may attend this House, in order to be examined, as Witnesses, upon the Second Reading of the Bill relating to the Provost and City of Edinburgh," being returned, acquainted the House, "That they had delivered their Message; and that the Commons have given Leave to the said Members to come to this House, as is desired by the said Message, if they think fit." Bill against the Provost and City of Edinburgh. The Counsel for the Bill, as likewise Counsel for the Provost and Magistrates of Edinburgh, were called in. And the said Provost appeared at the Bar. And the Counsel for the Bill were heard, to open the Allegations thereof. And the Verdict and Sentence against Captain Porteous, as also his Reprieve, were read. Captain Lyn was produced by the Counsel; and sworn, in order to be examined on some of the Allegations in the said Preamble. Then the Counsel were directed to withdraw. Ordered, That this House will proceed further on the said Bill To-morrow; and that the Cause appointed for that Day be put off to Friday next; and the other Causes on Cause-days removed in Course. Dominus Cancellarius declaravit præsens Parliamentum continuandum esse usque ad et in diem Mercurii, quartum diem instantis Maii, hora undecima Auroræ, Dominis sic decernentibus. St. Olave's Church rebuilding, Bill. Hodie 2a vice lecta est Billa, intituled, "An Act for re-building the Church of the Parish of St. Olave, in the City of London, and in the Borough of Southwark, in the County of Surrey." Vis. Falmouth. Ld. Abp. Cant. L. Bp. St. Asaph. L. Harrington, Sec. Hodie 3a vice lecta est Billa, intituled, "An Act to enable the present and future Proprietors and Inhabitants of the Houses in Red Lyon Square, in the County of Middlesex, to make a Rate on themselves, for raising Money sufficient to enclose, pave, watch, clean, and adorn, the said Square." 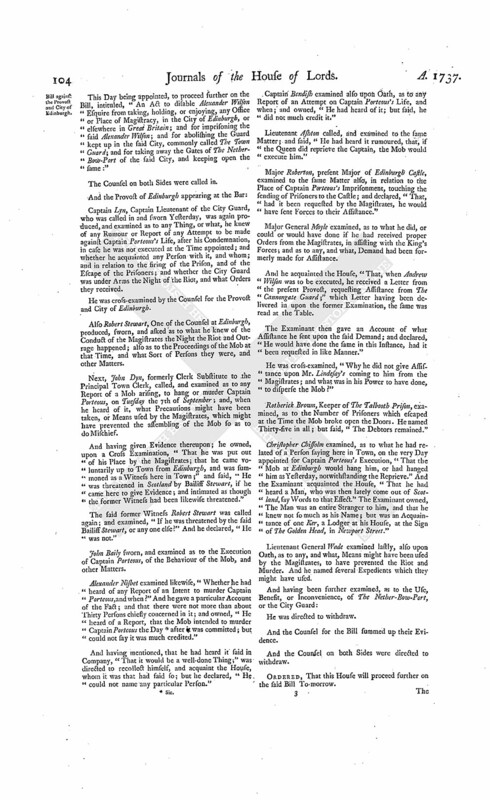 This Day being appointed, to proceed further on the Bill, intituled, "An Act to disable Alexander Wilson Esquire from taking, holding, or enjoying, any Office or Place of Magistracy, in the City of Edinburgh, or elsewhere in Great Britain; and for imprisoning the said Alexander Wilson; and for abolishing the Guard kept up in the said City, commonly called The Town Guard; and for taking away the Gates of The NetherBow-Port of the said City, and keeping open the same:"
The Counsel on both Sides were called in. Captain Lyn, Captain Lieutenant of the City Guard, who was called in and sworn Yesterday, was again produced, and examined as to any Thing, or what, he knew of any Rumour or Report of any Attempt to be made against Captain Porteous's Life, after his Condemnation, in case he was not executed at the Time appointed; and whether he acquainted any Person with it, and whom; and in relation to the firing of the Prison, and of the Escape of the Prisoners; and whether the City Guard was under Arms the Night of the Riot, and what Orders they received. He was cross-examined by the Counsel for the Provost and City of Edinburgh. Also Robert Stewart, One of the Counsel at Edinburgh, produced, sworn, and asked as to what he knew of the Conduct of the Magistrates the Night the Riot and Outrage happened; also as to the Proceedings of the Mob at that Time, and what Sort of Persons they were, and other Matters. Next, John Dyn, formerly Clerk Substitute to the Principal Town Clerk, called, and examined as to any Report of a Mob arising, to hang or murder Captain Porteous, on Tuesday the 7th of September; and, when he heard of it, what Precautions might have been taken, or Means used by the Magistrates, which might have prevented the assembling of the Mob so as to do Mischief. And having given Evidence thereupon; he owned, upon a Cross Examination, "That he was put out of his Place by the Magistrates; that he came voluntarily up to Town from Edinburgh, and was summoned as a Witness here in Town;" and said, "He was threatened in Scotland by Bailiff Stewart, if he came here to give Evidence; and intimated as though the former Witness had been likewise threatened." The said former Witness Robert Stewart was called again; and examined, "If he was threatened by the said Bailiff Stewart, or any one else?" And he declared, "He was not." John Baily sworn, and examined as to the Execution of Captain Porteous, of the Behaviour of the Mob, and other Matters. Alexander Nisbet examined likewise, "Whether he had heard of any Report of an Intent to murder Captain Porteous, and when?" And he gave a particular Account of the Fact; and that there were not more than about Thirty Persons chiefly concerned in it; and owned, "He heard of a Report, that the Mob intended to murder Captain Porteous the Day (fn. 1) after it was committed; but could not say it was much credited." And having mentioned, that he had heard it said in Company, "That it would be a well-done Thing;" was directed to recollect himself, and acquaint the House, whom it was that had said so; but he declared, "He could not name any particular Person." Captain Bendish examined also upon Oath, as to any Report of an Attempt on Captain Porteous's Life, and when; and owned, "He had heard of it; but said, he did not much credit it." Lieutenant Ashton called, and examined to the same Matter; and said, "He had heard it rumoured, that, if the Queen did reprieve the Captain, the Mob would execute him." Major Roberton, present Major of Edinburgh Castle, examined to the same Matter also, in relation to the Place of Captain Porteous's Imprisonment, touching the sending of Prisoners to the Castle; and declared, "That, had it been requested by the Magistrates, he would have sent Forces to their Assistance." Major General Moyle examined, as to what he did, or could or would have done if he had received proper Orders from the Magistrates, in assisting with the King's Forces; and as to any, and what, Demand had been formerly made for Assistance. And he acquainted the House, "That, when Andrew Wilson was to be executed, he received a Letter from the present Provost, requesting Assistance from The Cannongate Guard;" which Letter having been delivered in upon the former Examination, the same was read at the Table. The Examinant then gave an Account of what Assistance he sent upon the said Demand; and declared, He would have done the same in this Instance, had it been requested in like Manner." He was cross-examined, "Why he did not give Assistance upon Mr. Lindesay's coming to him from the Magistrates; and what was in his Power to have done, to disperse the Mob?" Rotherick Brown, Keeper of The Talbooth Prison, examined, as to the Number of Prisoners which escaped at the Time the Mob broke open the Doors. He named Thirty-five in all; but said, "The Debtors remained." Christopher Chissolm examined, as to what he had related of a Person saying here in Town, on the very Day appointed for Captain Porteous's Execution, "That the Mob at Edinburgh would hang him, or had hanged him as Yesterday, notwithstanding the Reprieve." And the Examinant acquainted the House, "That he had heard a Man, who was then lately come out of Scotland, say Words to that Effect." The Examinant owned, The Man was an entire Stranger to him, and that he knew not so much as his Name; but was an Acquaintance of one Ker, a Lodger at his House, at the Sign of The Golden Head, in Newport Street." Lieutenant General Wade examined lastly, also upon Oath, as to any, and what, Means might have been used by the Magistrates, to have prevented the Riot and Murder. And he named several Expedients which they might have used. He was directed to withdraw. And the Counsel for the Bill summed up their Evidence. And the Counsel on both Sides were directed to withdraw. Ordered, That this House will proceed further on the said Bill To-morrow. 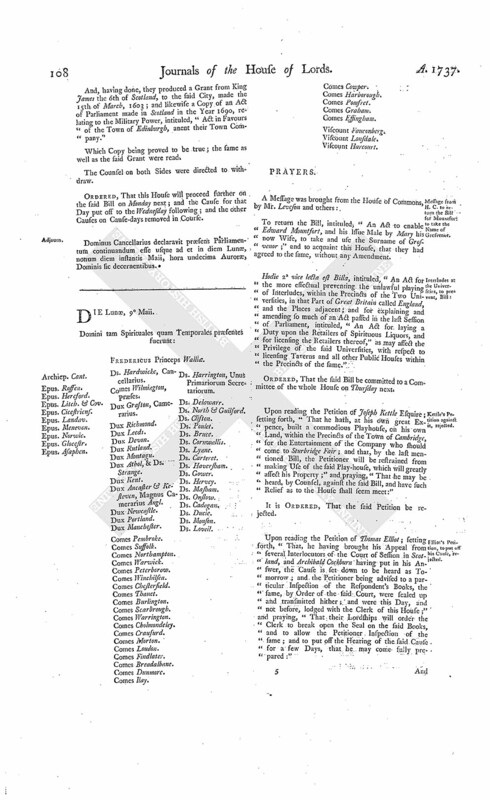 The Order being read, for the Second Reading of the Bill, intituled, "An Act for Relief of Insolvent Debtors:"
Norton's Bill, Reading put off. Ordered, That the said Bill be read a Second Time on Tuesday next. (fn. 2) Ordered, That the Bill to prevent the Statute of Limitations being pleaded, by any Persons claiming under the Will of Richard Norton Esquire, deceased, against any Claim to the Manor of Old Alresford, and Lands in the County of Southampton, settled in the Year 1657, which was appointed to be read a Second Time To-morrow, when Counsel were allowed to be heard as well for as against the same, be read a Second Time on this Day Sevennight; when Counsel may be heard as before allowed. Dominus Cancellarius declaravit præsens Parliamentum continuandum esse usque ad et in diem Jovis, quintum diem instantis Maii, hora undecima Auroræ, Dominis sic decernentibus. Against Interludes in the Universities, Bill. 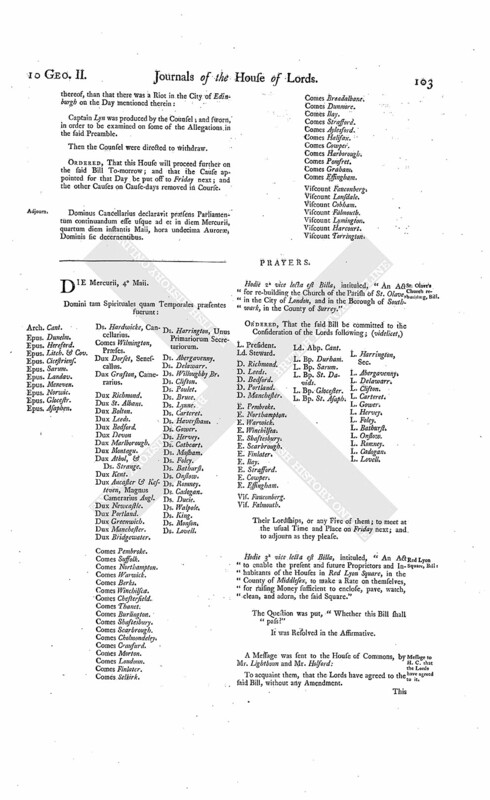 With a Bill, intituled, "An Act for the more effectual preventing the unlawful playing of Interludes within the Precincts of the Two Universities, in that Part of Great Britain called England, and the Places adjacent; and for the explaining and amending so much of an Act passed in the last Session of Parliament, intituled, "An Act for laying a Duty upon the Retailers of Spirituous Liquors, and for licensing the Retailers thereof," as may affect the Privilege of the said Universities, with respect to licensing Taverns and all other Public Houses within the Precincts of the same;" to which they desire the Concurrence of this House. Messages from H. C. to return the E. of Rockingham's Bill. To return the Bill, intituled, "An Act for establishing and confirming a Partition of the Estates of Sir Robert Furnese Baronet, deceased, among his Three Daughters and Coheirs; and for settling their several specific Shares and Allotments, to such Uses as their several undivided Third Parts thereof stood limited before such Partition; and for other Purposes therein mentioned;" and to acquaint this House, that they have agreed to the said Bill, with One Amendment, whereunto they desire their Lordships Concurrence. To return the Bill, intituled, "An Act to enable Peter Legh of Lyme Esquire to make a present Settlement on his Nephew Peter Legh the Younger, and his Issue Male, preferable to his own Issue Male; and to enable his said Nephew and other Tenants for Life to make Jointures and Provision for Daughters and Younger Sons, in the Life-time of the said Peter Legh the Elder, and with his Consent;" and to acquaint this House, that they have agreed to the same, with some Amendments, whereunto they desire their Lordships Concurrence. The House proceeded to take into Consideration the Amendment made by the Commons to the Earl of Rockingham's Bill. And the same, being read by the Clerk, was agreed to by the House. The House also proceeded to take into Consideration the Amendments made by the Commons to the last mentioned Bill. And the same, being likewise read by the Clerk, were agreed to by the House. To acquaint them, that the Lords have agreed to the said Amendments. It is Ordered, That the House be put into a Committee thereupon on Tuesday next. Bp. Bath & Wells takes the Oaths. John Lord Bishop of Bath and Wells, at the Table, took the Oaths, and made and subscribed the Declaration, and also took and subscribed the Oath of Abjuration, pursuant to the Statutes. Against the Provost and City of Edinburgh, Bill. 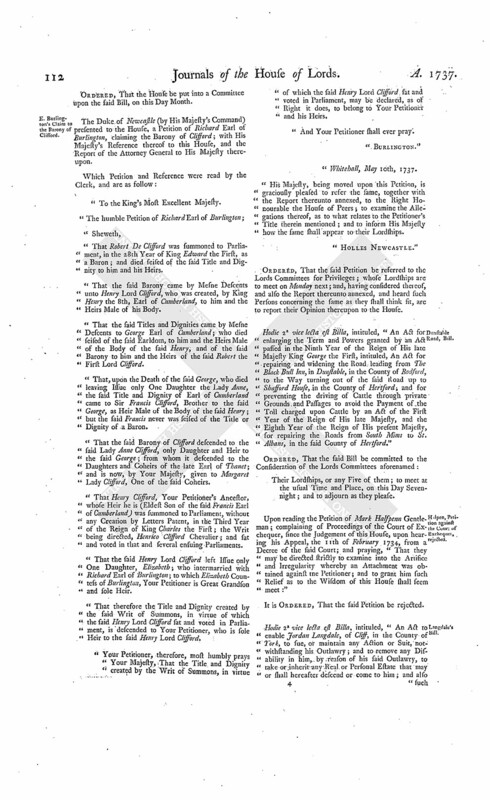 This Day being appointed, for the further proceeding on the Bill, intituled, "An Act to disable Alexander Wilson Esquire from taking, holding, or enjoying, any Office, or Place of Magistracy, in the City of Edinburgh, or elsewhere in Great Britain; and for imprisoning the said Alexander Wilson; and for abolishing the Guard kept up in the said City, commonly called The Town Guard; and for taking away the Gates of The Nether-Bow-Port of the said City, and keeping open the same:"
And called Thomas Boyce, One of the Council at Edinburgh; who, being sworn, was examined, as to any or what Report there was of a Tumult, or Riot, that was expected to happen on the Wednesday first appointed for the Execution of Captain Porteous. And he owned, "There was such a Report; but it was not credited." He was also examined as to the Behaviour of the Magistrates on that Occasion, their being abused by the Mob; and likewise examined by the Counsel in Behalf of the City of Edinburgh, in relation to the Usefulness of the Town Guard. John Baird of Leith produced, sworn, and examined, as to the Beginning of the Riot, the Behaviour of the Provost, his sending to General Moyle for the King's Forces, and the Manner of it; and as to what Endeavours were used for the Discovery of the Rioters. Duncan Forbes Esquire, His Majesty's Advocate for Scotland, examined likewise, in relation to the aforementioned Report, and of what Credit was given thereto; touching the Power of the Magistrates in removing of Prisoners under Sentence of Death; and concerning the Usefulness or Disadvantage he apprehended the City Guard and The Nether-Bow-Port were of. Robert Yates called, and examined as to what Apprehension either Captain Porteous or his Friends were under, of any Attempt from the Mob against his Life: And he declared, "They were under no Apprehension of any such Thing." William Eure produced likewise, and examined in relation to the same Matter; and acquainted the House, That he was with the Captain the Evening before he was murdered; but did not perceive he was under any Apprehension of Danger." Patrick Lindesay Esquire also examined upon Oath, with respect to the Report that a Tumult would happen: And acquainted the House, "Nobody thought any such Thing probable;" mentioned former Reports of the like Nature, which proved frivolous; gave an Account of the Behaviour of the Provost, in directing Inquiry to be made by Captain Lyn; related also his Behaviour as to sending to General Moyle for the King's Forces (the Examinant undertaking to go himself), and gave an Account of what passed thereupon; mentioned Methods taken by the Provost to find out the Rioters, and what Examinations were taken by the Magistrates. Examined likewise as to Signals given in case of Danger; but owned, "In this Case, none could be used, the Mob growing of a sudden so numerous, and crying out, Come, all honest Men, and revenge innocent Blood." And being lastly asked as to the Use or Advantage of the Town Guard and Nether-Bow-Port; expressed his Opinion of their Usefulness in several respects. Lastly, Thomas Young, the City Treasurer, was examined, in like Manner, touching the Behaviour of the Magistrates in endeavouring to keep the Peace of the City: And related what he knew of the Riot in its Beginning; and of Mr. Lindesay's being sent to the General; and of the Examinant's Endeavours to go also. Likewise examined as to any Attempts used to read the Proclamation, touching the Drums belonging to the City Guard, and the Alarm Bell, and as to the Usefulness of the City Guard, and their Behaviour; and was crossexamined, as to any Application made to remove Captain Portcous to the Castle, in relation to the furnishing the said Guard with Ammunition, and as to the Prosecution of the said Captain, and who paid the Expence thereof. The Counsel on both Sides were directed to withdraw. Ordered, That this House will proceed further on the said Bill To-morrow, at Twelve a Clock. Ordered, That the arguing the Errors on a Writ of Error, wherein Hugh Montgomery is Plaintiff, and Charles Dempsy Defendant, which stands to be heard To-morrow, be put off to Monday next; and the other Causes on Cause-days removed in Course. Dominus Cancellarius declaravit præsens Parliamentum continuandum esse usque ad et in diem Veneris, sextum diem instantis Maii, hora undecima Auroræ, Dominis sic decernentibus. Viscount Harcourt. Ds. Harrington, Unus Primariorum Secretariorum. 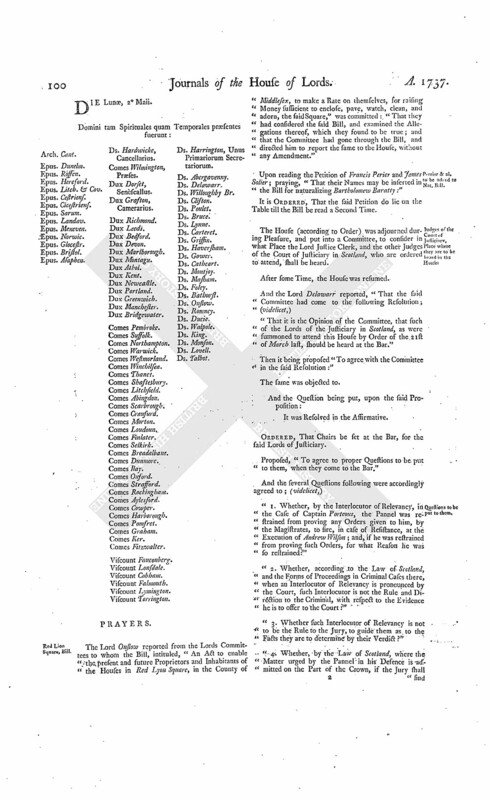 Upon reading the Petition of Eleazar Peirson, Marshal of the Four Courts in Dublin, Respondent to the Appeal of William Lord Baron of Howth in the Kingdom of Ireland; setting forth, "That it is probable the hearing the said Appeal may not come on this Session, unless the same be brought forward on some vacant Bye-day for that Purpose; and that the Petitioner, as Marshal, hath many Prisoners in his Custody, which requires his constant Care and Attendance; and is very far advanced in Years, and may not be able to attend this House another Session;" and praying, That such vacant Bye-day may be appointed, as to their Lordships shall seem meet:"
The Petitioner and his Agent were called in; and proving upon Oath, "That due Notice of this Application had been given to Mr. Pickard the Appellant's Agent:"
Ordered, That this House will hear the said Cause, by Counsel, at the Bar, on Tuesday the 17th Day of this Instant May. And the Provost of Edinburgh appeared at the Bar. And John Cochran, Bailiff of The Cannongate, was produced, sworn, and examined, as to the Behaviour of the Provost during the Time of the Riot, as to any or what Attempts were made by the Magistrates to read the Proclamation, what Steps were taken to discover the Rioters, and restore the Peace of the City, the Usefulness of the City Guard, and Advantage of the Nether-Bow-Port. 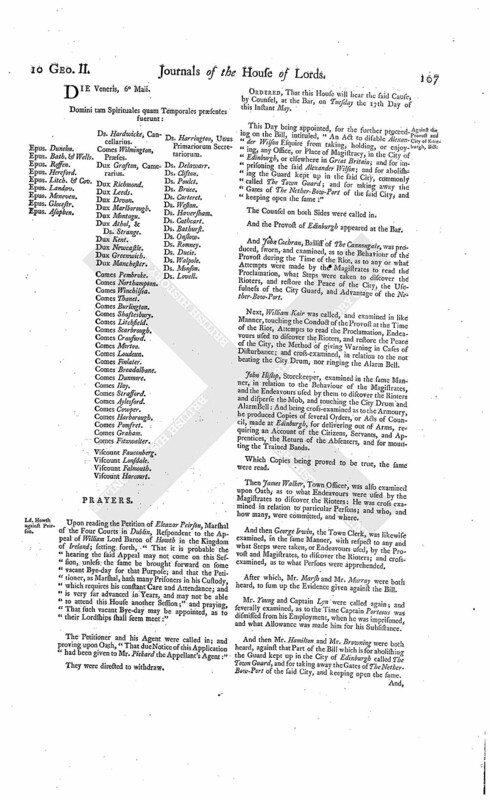 Next, William Kair was called, and examined in like Manner, touching the Conduct of the Provost at the Time of the Riot, Attempts to read the Proclamation, Endeavours used to discover the Rioters, and restore the Peace of the City, the Method of giving Warning in Cases of Disturbance; and cross-examined, in relation to the not beating the City Drum, nor ringing the Alarm Bell. John Hislop, Storekeeper, examined in the same Manner, in relation to the Behaviour of the Magistrates, and the Endeavours used by them to discover the Rioters and disperse the Mob, and touching the City Drum and AlarmBell: And being cross-examined as to the Armoury, he produced Copies of several Orders, or Acts of Council, made at Edinburgh, for delivering out of Arms, requiring an Account of the Citizens, Servants, and Apprentices, the Return of the Absenters, and for mounting the Trained Bands. Which Copies being proved to be true, the same were read. Then James Walker, Town Officer, was also examined upon Oath, as to what Endeavours were used by the Magistrates to discover the Rioters: He was cross examined in relation to particular Persons; and who, and how many, were committed, and where. And then George Irwin, the Town Clerk, was likewise examined, in the same Manner, with respect to any and what Steps were taken, or Endeavours used, by the Provost and Magistrates, to discover the Rioters; and crossexamined, as to what Persons were apprehended. After which, Mr. Marsh and Mr. Murray were both heard, to sum up the Evidence given against the Bill. Mr. Young and Captain Lyn were called again; and severally examined, as to the Time Captain Porteous was dismissed from his Employment, when he was imprisoned, and what Allowance was made him for his Subsistance. And then Mr. Hamilton and Mr. Browning were both heard, against that Part of the Bill which is for abolishing the Guard kept up in the City of Edinburgh called The Town Guard, and for taking away the Gates of The NetherBow-Port of the said City, and keeping open the same. And, having done, they produced a Grant from King James the 6th of Scotland, to the said City, made the 15th of March, 1603; and likewise a Copy of an Act of Parliament made in Scotland in the Year 1690, relating to the Military Power, intituled, "Act in Favours of the Town of Edinburgh, anent their Town Company." Which Copy being proved to be true; the same as well as the said Grant were read. Ordered, That this House will proceed further on the said Bill on Monday next; and the Cause for that Day put off to the Wednesday following; and the other Causes on Cause-days removed in Course. Dominus Cancellarius declaravit præsens Parliamentum continuandum esse usque ad et in diem Lunæ, nonum diem instantis Maii, hora undecima Auroræ, Dominis sic decernentibus. Message from H. C. to return the Bill for Mountfort to take the Name of Gresvenor. To return the Bill, intituled, "An Act to enable Edward Mountfort, and his Issue Male by Mary his now Wife, to take and use the Surname of Grosvenor;" and to acquaint this House, that they had agreed to the same, without any Amendment. Hodie 2a vice lecta est Billa, intituled, "An Act for the more effectual preventing the unlawful playing of Interludes, within the Precincts of the Two Universities, in that Part of Great Britain called England, and the Places adjacent; and for explaining and amending so much of an Act passed in the last Session of Parliament, intituled, "An Act for laying a Duty upon the Retailers of Spirituous Liquors, and for licensing the Retailers thereof," as may affect the Privilege of the said Universities, with respect to licensing Taverns and all other Public Houses within the Precincts of the same." Ordered, That the said Bill be committed to a Committee of the whole House on Thursday next. Kettle's Petition against it, rejected. 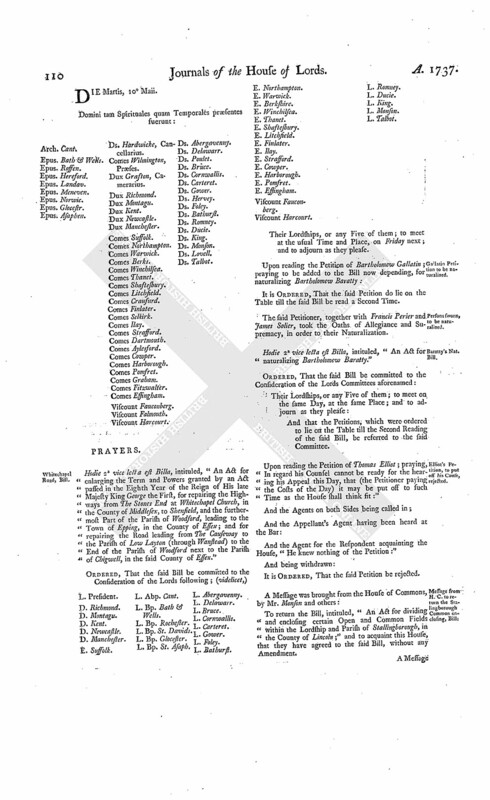 Upon reading the Petition of Joseph Kettle Esquire; setting forth, "That he hath, at his own great Expence, built a commodious Playhouse, on his own Land, within the Precincts of the Town of Cambridge, for the Entertainment of the Company who should come to Sturbridge Fair; and that, by the last mentioned Bill, the Petitioner will be restrained from making Use of the said Play-house, which will greatly affect his Property;" and praying, "That he may be heard, by Counsel, against the said Bill, and have such Relief as to the House shall seem meet:"
It is Ordered, That the said Petition be rejected. Elliot's Petition, to put off his Cause, rejected. Upon reading the Petition of Thomas Elliot; setting forth, "That, he having brought his Appeal from several Interlocutors of the Court of Session in Scotland, and Archibald Cockburn having put in his Answer, the Cause is set down to be heard as Tomorrow; and the Petitioner being advised to a particular Inspection of the Respondent's Books, the same, by Order of the said Court, were sealed up and transmitted hither; and were this Day, and not before, lodged with the Clerk of this House;" and praying, "That their Lordships will order the Clerk to break open the Seal on the said Books, and to allow the Petitioner Inspection of the same; and to put off the Hearing of the said Cause for a few Days, that he may come fully prepared:"
With a Bill, intituled, "An Act for enlarging the Term and Powers granted by an Act passed in the Ninth Year of the Reign of His late Majesty King George the First, intituled, "An Act for repairing and widening the Road leading from The Black Bull Inn in Dunstable, in the County of Bedford, to the Way turning out of the said Road up to Strafford House, in the County of Hertford; and for preventing the driving of Cattle through private Grounds and Passages, to avoid the Payment of the Toll charged upon Cattle by an Act of the First Year of the Reign of His late Majesty, and the Eighth Year of the Reign of His present Majesty, for repairing the Roads from South Mims to St. Albans, in the County of Hertford;" to which they desire the Concurrence of this House. With a Bill, intituled, "An Act for regulating the Company of Watermen, Wherrymen, and Lightermen, rowing on the River Thames, between Gravesend, in the County of Kent, and Windsor, in the County of Berks;" to which they desire the Concurrence of this House. 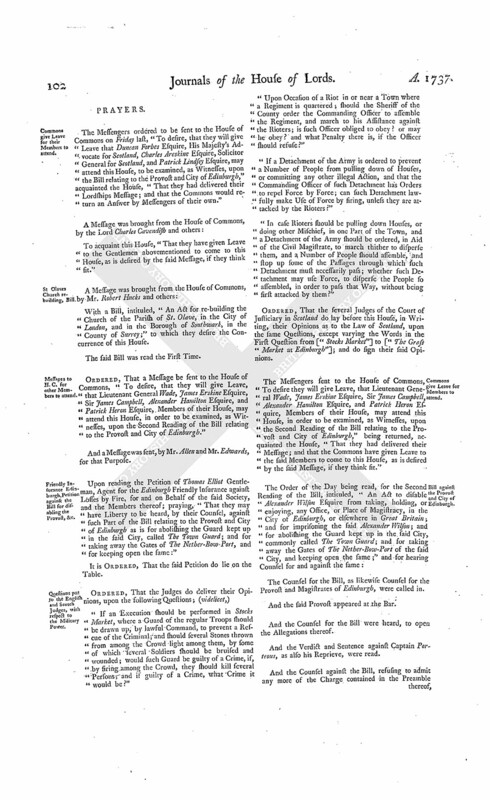 With a Bill, intituled, "An Act for enlarging the Term and Powers granted by an Act passed in the Eighth Year of the Reign of His late Majesty King George the First, for repairing the Highways from The Stones End at White Chapel Church, in the County of Middlesex, to Shenfield, and to the furthermost Part of the Parish of Woodford, leading to the Town of Epping, in the County of Essex; and for repairing the Road leading from the Causeway in the Parish of Low Layton (through Wanstead) to the End of the Parish of Woodford next to the Parish of Chigwell, in the said County of Essex;" to which they desire the Concurrence of this House. Act for building Westminster Bridge, to explain, Bill. 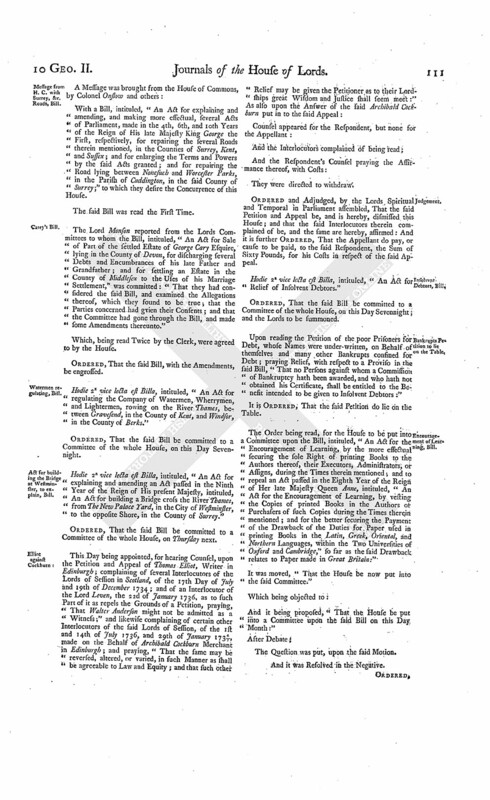 With a Bill, intituled, "An Act for explaining and amending an Act passed in the Ninth Year of the Reign of His present Majesty, intituled, An Act for building a Bridge cross the River Thames, from The New Palace Yard, in the City of Westminster, to the opposite Shore in the County of Surrey;" to which they desire the Concurrence of this House. Langdale to sue, notwithstanding his Attainder, Bill. With a Bill, intituled, "An Act to enable Jordan Langdale, of Cliff, in the County of York, to sue or maintain any Action or Suit, notwithstanding his Outlawry; and to remove any Disability in him, by reason of his Outlawry, to take or inherit any Real or Personal Estate that may or shall hereafter descend or come to him, and also such Real Estate as he was entitled unto, in Reversion or Remainder, before his said Outlawry;" to which they desire the Concurrence of this House. And the Duke of Newcastle acquainted the House, That His Majesty, having been apprized of the Contents of the last mentioned Bill, had no Objection to their Lordships proceeding thereon, with respect to the Interest of the Crown concerned therein." This Day being appointed for the further proceeding upon the Bill, intituled, "An Act to disable Alexander Wilson Esquire from taking, holding, or enjoying, any Office or Place of Magistracy in the City of Edinburgh, or elsewhere in Great Britain; and for imprisoning the said Alexander Wilson; and for abolishing the Guard kept up in the said City, commonly called The Town Guard; and for taking away the Gates of The-Nether-Bow-Port of the said City, and keeping open the same:"
And the Provost appeared at the Bar. Ordered, That the said Bill be committed to a Committee of the whole House, on Wednesday next; and the Lords to be summoned; and the Cause which stands to be heard on that Day be put off to Thursday next. Dominus Cancellarius declaravit præsens Parliamentum continuandum esse usque ad et in diem Martis, decimum diem instantis Maii, hora undecima Auroræ, Dominis sic decernentibus. Hodie 2a vice lecta est Billa, intituled, "An Act for enlarging the Term and Powers granted by an Act passed in the Eighth Year of the Reign of His late Majesty King George the First, for repairing the Highways from The Stones End at Whitechapel Church, in the County of Middlesex, to Shenfield, and the furthermost Part of the Parish of Woodford, leading to the Town of Epping, in the County of Essex; and for repairing the Road leading from The Causeway to the Parish of Low Layton (through Wanstead) to the End of the Parish of Woodford next to the Parish of Chigwell, in the said County of Essex." Viscount Harcourt. L. Abp. Cant. L. Bp. Bath & Wells. L. Bp. St. Asaph. L. Abergavenny. Gallatin Petition to be naturalized. It is Ordered, That the said Petition do lie on the Table till the said Bill be read a Second Time. Persons sworn, to be naturalized. The said Petitioner, together with Francis Perier and James Solier, took the Oaths of Allegiance and Supremacy, in order to their Naturalization. Hodie 2a vice lecta est Billa, intituled, "An Act for naturalizing Bartholomew Baratty." And that the Petitions, which were ordered to lie on the Table till the Second Reading of the said Bill, be referred to the said Committee. Elliot's Petition to put off his Cause, rejected. Upon reading the Petition of Thomas Elliot; praying, In regard his Counsel cannot be ready for the hearing his Appeal this Day, that (the Petitioner paying the Costs of the Day) it may be put off to such Time as the House shall think fit:"
And the Agent for the Respondent acquainting the House, "He knew nothing of the Petition:"
To return the Bill, intituled, "An Act for dividing and enclosing certain Open and Common Fields within the Lordship and Parish of Stallingborough, in the County of Lincoln;" and to acquaint this House, that they have agreed to the said Bill, without any Amendment. Message from H. C. with Surrey, &c. Roads, Bill. 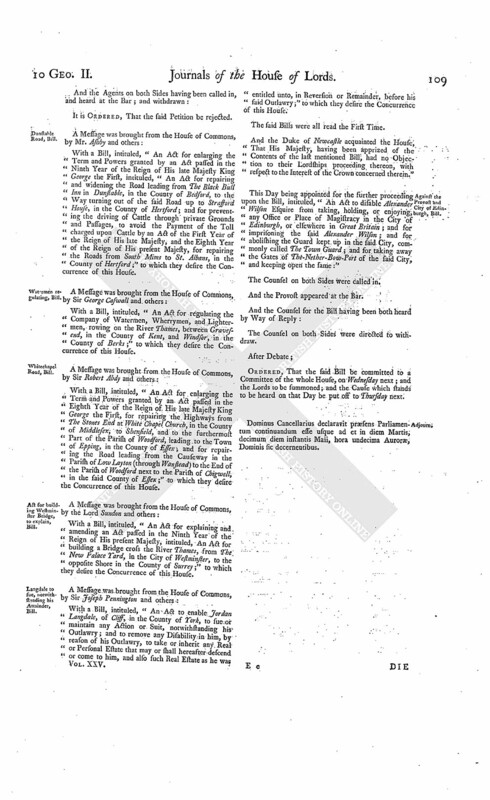 With a Bill, intituled, "An Act for explaining and amending, and making more effectual, several Acts of Parliament, made in the 4th, 6th, and 10th Years of the Reign of His late Majesty King George the First, respectively, for repairing the several Roads therein mentioned, in the Counties of Surrey, Kent, and Sussex; and for enlarging the Terms and Powers by the said Acts granted; and for repairing the Road lying between Nonesuch and Worcester Parks, in the Parish of Cuddington, in the said County of Surrey;" to which they desire the Concurrence of this House. The Lord Monson reported from the Lords Committees to whom the Bill, intituled, "An Act for Sale of Part of the settled Estate of George Cary Esquire, lying in the County of Devon, for discharging several Debts and Encumbrances of his late Father and Grandfather; and for settling an Estate in the County of Middlesex to the Uses of his Marriage Settlement," was committed: "That they had considered the said Bill, and examined the Allegations thereof, which they found to be true; that the Parties concerned had given their Consents; and that the Committee had gone through the Bill, and made some Amendments thereunto." Hodie 2a vice lecta est Billa, intituled, "An Act for regulating the Company of Watermen, Wherrymen, and Lightermen, rowing on the River Thames, between Gravesend, in the County of Kent, and Windsor, in the County of Berks." Ordered, That the said Bill be committed to a Committee of the whole House, on this Day Sevennight. Act for building the Bridge at Westminster, to explain, Bill. Hodie 2a vice lecta est Billa, intituled, "An Act for explaining and amending an Act passed in the Ninth Year of the Reign of His present Majesty, intituled, An Act for building a Bridge cross the River Thames, from The New Palace Yard, in the City of Westminster, to the opposite Shore, in the County of Surrey." Ordered and Adjudged, by the Lords Spiritual and Temporal in Parliament assembled, That the said Petition and Appeal be, and is hereby, dismissed this House; and that the said Interlocutors therein complained of be, and the same are hereby, affirmed: And it is further Ordered, That the Appellant do pay, or cause to be paid, to the said Respondent, the Sum of Sixty Pounds, for his Costs in respect of the said Appeal. Hodie 2a vice lecta est Billa, intituled, "An Act for Relief of Insolvent Debtors." Ordered, That the said Bill be committed to a Committee of the whole House, on this Day Sevennight; and the Lords to be summoned. Bankrupts Petition to lie on the Table. 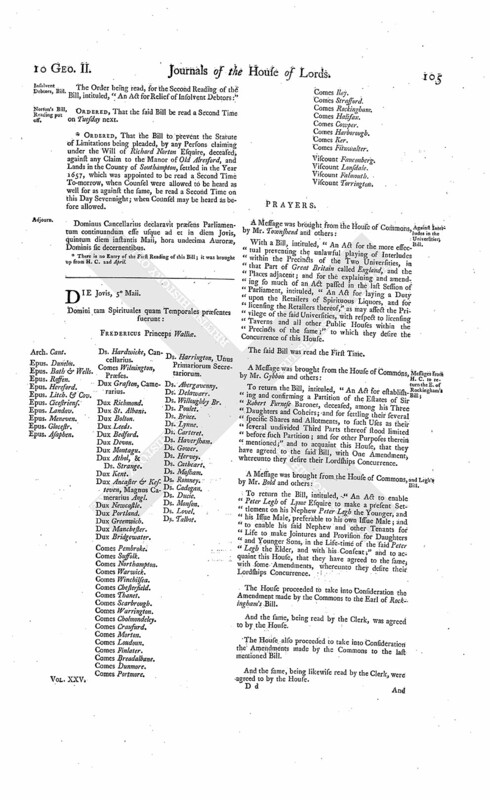 Upon reading the Petition of the poor Prisoners for Debt, whose Names were under-written, on Behalf of themselves and many other Bankrupts confined for Debt; praying Relief, with respect to a Proviso in the said Bill, "That no Persons against whom a Commission of Bankruptcy hath been awarded, and who hath not obtained his Certificate, shall be entitled to the Benefit intended to be given to Insolvent Debtors:"
The Order being read, for the House to be put into a Committee upon the Bill, intituled, "An Act for the Encouragement of Learning, by the more effectual securing the sole Right of printing Books to the Authors thereof, their Executors, Administrators, or Assigns, during the Times therein mentioned; and to repeal an Act passed in the Eighth Year of the Reign of Her late Majesty Queen Anne, intituled, "An Act for the Encouragement of Learning, by vesting the Copies of printed Books in the Authors or Purchasers of such Copies during the Times therein mentioned; and for the better securing the Payment of the Drawback of the Duties for Paper used in printing Books in the Latin, Greek, Oriental, and Northern Languages, within the Two Universities of Oxford and Cambridge," so far as the said Drawback relates to Paper made in Great Britain:"
It was moved, "That the House be now put into the said Committee." And it being proposed, "That the House be put into a Committee upon the said Bill on this Day Month:"
The Question was put, upon the said Motion. Ordered, That the House be put into a Committee upon the said Bill, on this Day Month. E. Burlington's Claim to the Barony of Clifford. The Duke of Newcastle (by His Majesty's Command) presented to the House, a Petition of Richard Earl of Burlington, claiming the Barony of Clifford; with His Majesty's Reference thereof to this House, and the Report of the Attorney General to His Majesty thereupon. "That Robert De Clifford was summoned to Parliament, in the 28th Year of King Edward the First, as a Baron; and died seised of the said Title and Dignity to him and his Heirs. "That the said Barony came by Mesne Descents unto Henry Lord Clifford, who was created, by King Henry the 8th, Earl of Cumberland, to him and the Heirs Male of his Body. "That the said Titles and Dignities came by Mesne Descents to George Earl of Cumberland; who died seised of the said Earldom, to him and the Heirs Male of the Body of the said Henry, and of the said Barony to him and the Heirs of the said Robert the First Lord Clifford. "That, upon the Death of the said George, who died leaving Issue only One Daughter the Lady Anne, the said Title and Dignity of Earl of Cumberland came to Sir Francis Clifford, Brother to the said George, as Heir Male of the Body of the said Henry; but the said Francis never was seised of the Title or Dignity of a Baron. "That the said Barony of Clifford descended to the said Lady Anne Clifford, only Daughter and Heir to the said George; from whom it descended to the Daughters and Coheirs of the late Earl of Thanet; and is now, by Your Majesty, given to Margaret Lady Clifford, One of the said Coheirs. "That Henry Clifford, Your Petitioner's Ancestor, whose Heir he is (Eldest Son of the said Francis Earl of Cumberland) was summoned to Parliament, without any Creation by Letters Patent, in the Third Year of the Reign of King Charles the First; the Writ being directed, Henrico Clifford Chevalier; and sat and voted in that and several ensuing Parliaments. "That the said Henry Lord Clifford left Issue only One Daughter, Elizabeth; who intermarried with Richard Earl of Burlington; to which Elizabeth Countess of Burlington, Your Petitioner is Great Grandson and sole Heir. "That therefore the Title and Dignity created by the said Writ of Summons, in virtue of which the said Henry Lord Clifford sat and voted in Parliament, is descended to Your Petitioner, who is sole Heir to the said Henry Lord Clifford. "Your Petitioner, therefore, most humbly prays Your Majesty, That the Title and Dignity created by the Writ of Summons, in virtue of which the said Henry Lord Clifford sat and voted in Parliament, may be declared, as of Right it does, to belong to Your Petitioner and his Heirs. "And Your Petitioner shall ever pray. 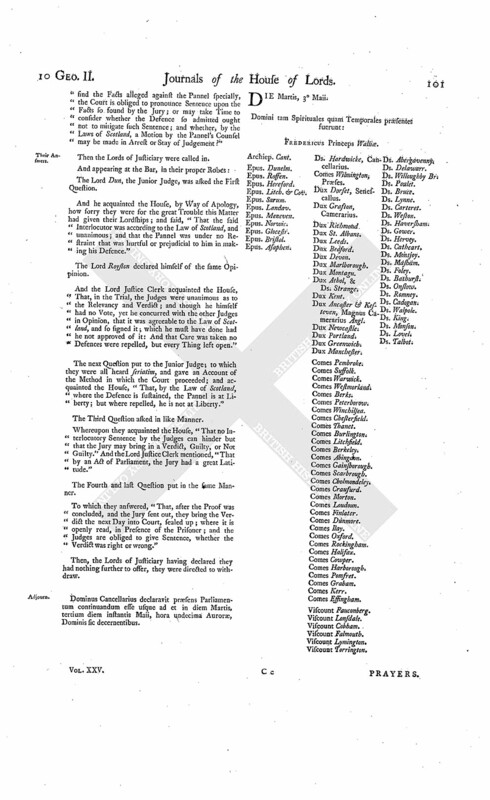 "His Majesty, being moved upon this Petition, is graciously pleased to refer the same, together with the Report thereunto annexed, to the Right Honourable the House of Peers; to examine the Allegations thereof, as to what relates to the Petitioner's Title therein mentioned; and to inform His Majesty how the same shall appear to their Lordships. 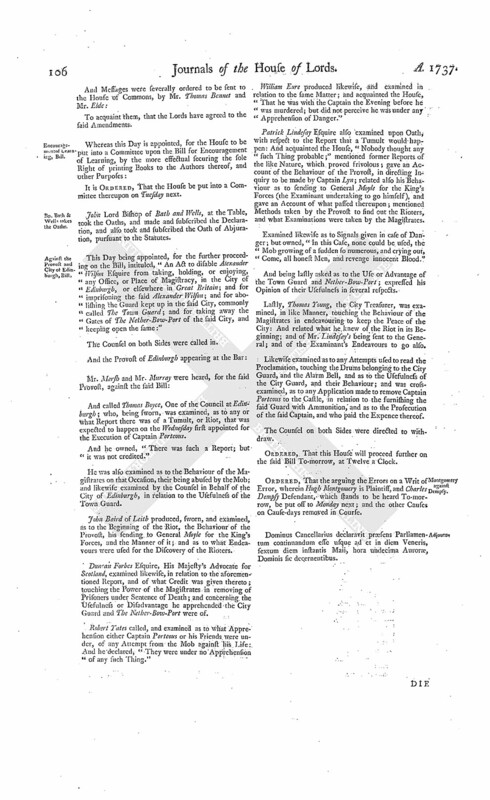 Ordered, That the said Petition be referred to the Lords Committees for Privileges; whose Lordships are to meet on Monday next; and, having considered thereof, and also the Report thereunto annexed, and heard such Persons concerning the same as they shall think fit, are to report their Opinion thereupon to the House. Hodie 2a vice lecta est Billa, intituled, "An Act for enlarging the Term and Powers granted by an Act passed in the Ninth Year of the Reign of His late Majesty King George the First, intituled, An Act for repairing and widening the Road leading from The Black Bull Inn, in Dunstable, in the County of Bedford, to the Way turning out of the said Road up to Shafford House, in the County of Hertford; and for preventing the driving of Cattle through private Grounds and Passages to avoid the Payment of the Toll charged upon Cattle by an Act of the First Year of the Reign of His late Majesty, and the Eighth Year of the Reign of His present Majesty, for repairing the Roads from South Mims to St. Albans, in the said County of Hertford." Their Lordships, or any Five of them; to meet at the usual Time and Place, on this Day Sevennight; and to adjourn as they please. Halpen, Petition against the Court of Exchequer, rejected. Upon reading the Petition of Mark Halfpenn Gentleman; complaining of Proceedings of the Court of Exchequer, since the Judgement of this House, upon hearing his Appeal, the 11th of February 1734, from a Decree of the said Court; and praying, "That they may be directed strictly to examine into the Artifice and Irregularity whereby an Attachment was obtained against the Petitioner; and to grant him such Relief as to the Wisdom of this House shall seem meet:"
Hodie 2a vice lecta est Billa, intituled, "An Act to enable Jordan Langdale, of Cliff, in the County of York, to sue, or maintain any Action or Suit, notwithstanding his Outlawry; and to remove any Disability in him, by reason of his said Outlawry, to take or inherit any Real or Personal Estate that may or shall hereafter descend or come to him; and also such Real Estate as he was entitled unto, in Reversion or Remainder, before his said Outlawry." Their Lordships, or any Five of them; to meet at the usual Place, on Friday next; and to adjourn as they please. Dominus Cancellarius declaravit præsens Parliamentum continuandum esse usque ad et in diem Mercurii, undecimum diem instantis Maii, hora undecima Auroræ, Dominis sic decernentibus. 2. There is no Entry of the First Reading of this Bill; it was brought up from H. C. 22d April.